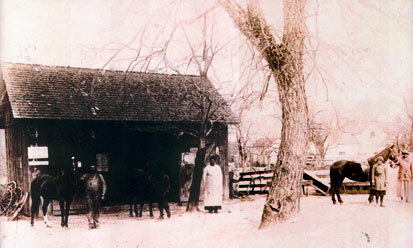 “Blacksmith Shop, circa 1890,” braddockheritage.org/, accessed April 24, 2019, http://braddockheritage.org/items/show/162. Moses Parker and Horace Gibson, former slaves who purchased their freedom, moved to Fairfax County from Culpeper. They opened a blacksmith shop on the corner of Little River Turnpike and today's Prosperity Avenue and served travellers between Alexandria and points west. By 1878, the Gibsons and Parkers owned 400 acres of land that formed Ilda, a community of shops and a church likely named after Matilda Gibson Parker, daughter of Horace and daughter-in-law of Moses. In this photo, Matilda Gibson Parker stands in the center.